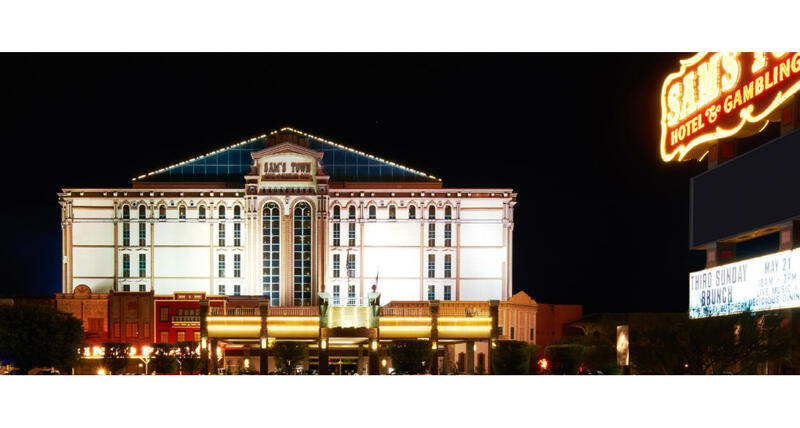 Known as the place "where locals bring their friends," Sams Town Hotel and Casino on the east side of Las Vegas is always a favorite. This western-themed Boulder Strip resort has been bringing 'em back since 1979 by being a friendly host and offering a variety of entertainment options. Front and center is the vast, three-level gaming hall that features a large race and sports book, slot machines, all of the table games, a bingo parlor, keno, and poker room. The B-Connected slot club is popular with locals for its cash-back incentives and other deals. Extracurricular activities include an 18-screen movie complex, a 24-hour bowling center and the four-times-daily "Sunset Stampede" laser and water show in Mystic Falls Park, an amazing nine-story atrium with real trees, waterfalls and trails. There is also a full-service beauty salon, jewelry and logo stores. Once you've got your hair up head over to Roxy's Lounge for live bands and Sam's Town Live!, a 1,100-seat facility that features top headliners. The dining scene features the Angry Butcher Steakhouse along with an all-you-can-eat buffet, T.G.I. Fridays and a food court. Sam's Town boasts almost 650 elegantly appointed rooms and suites, plus two spacious RV parks with a full range of services, from cable TV to pet runs.